Glucosamine sulfate and Chondroitin sulfate are structural elements of connective tissue, participate in its formation, prevents the processes of destruction of cartilage and stimulates its regeneration. Glucosamine being an endogenous molecule activates the substances synthesis that serve as a building material for articular membranes, intraarticular liquid and cartilaginous tissue, protects the cartilage from chemical injuries, has a moderate anti-inflammatory action. Boswellia extract (Boswellia serrata – gum resin extract) has the strongest anti-inflammatory effect, helps to cope with the destruction of cartilage, activates recovery processes. Saint John's wort leaf (Hypericum perforatum leaf), Liquorice (Glycyrrhiza glabra root) and Breckland thyme leaf extract (Thymus serpyllum extract) Effective with disorders of the musculoskeletal system (rheumatism, arthritis and arthrosis). A joint is a complex biochemical structure. Malnutrition, blood supply disturbance of any of the joints components is immediately accompanied by a decrease of a number of functions carried out by the joint. Joints diseases occur due to various reasons among which are injuries, metabolic and immune disorders in the organism, ligamentous disruption, blood supply disturbance of bone and cartilaginous tissue, and also overweight. 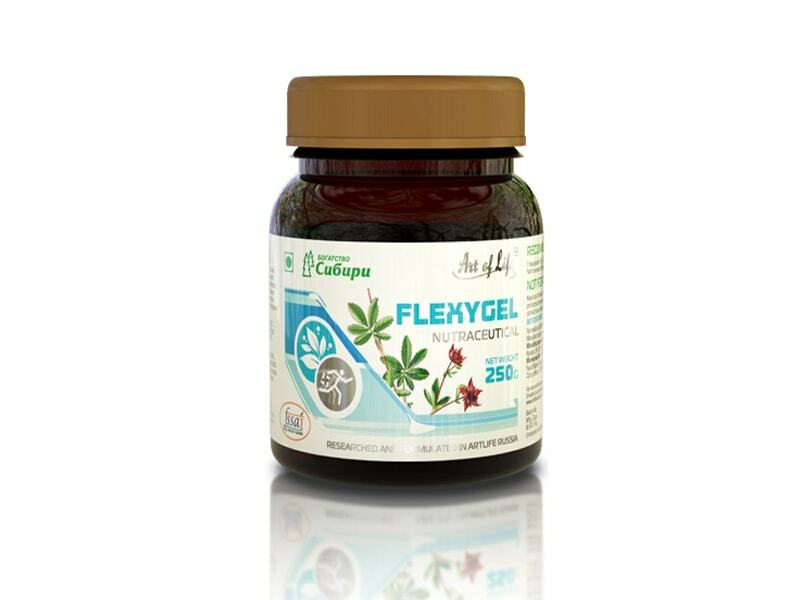 A combined action of active ingredients of the Flxygel consists in a normalization of musculoskeletal system functioning due to a full-fledged nutritious support and an anti-inflammatory activity. Dosage : 1 teaspoonful 2 times a day during meal with 1 cup of water or pre-dissolved in ½ cup of water. For children, the dosage and dosing frequency are selected individually,depending on the age and purpose of the application. Shelf life : 2 years from date of manufacture of the product. Storage: Store at room temperature in a dry place inaccessible to children. NOT FOR MEDICINAL USE. Nutraceutical is not to be used as substitute for a varied diet . please do not exceed the recommended daily usage.